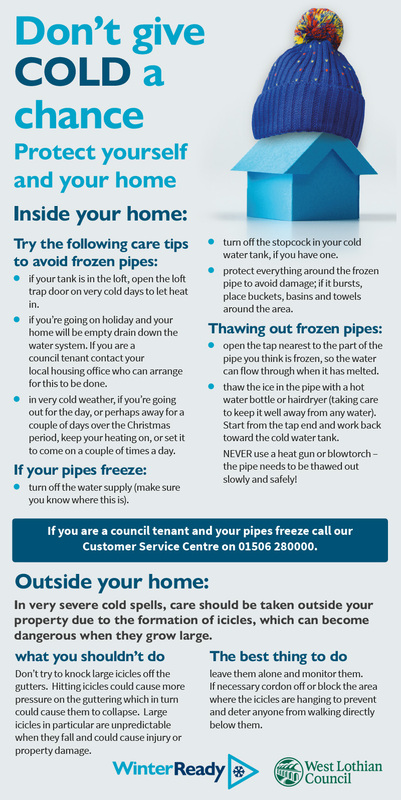 The big freeze can bring problems inside your home and if you live in a flat it can also involve your neighbours. It is worth taking steps now to protect yourself and your home. In an emergency, do you know how to turn the water off to your home? Do you know where your water valve is? Burst pipes can happen at any time and when water is pouring into your home you need to act quickly to turn off the water at the main stop tap. You should find this under the kitchen sink or where the service pipe enters your home. Drain your system: Do this by turning on all your cold taps and do what you can to collect and manage the leak. You may see your ceilings starting to bulge. Be careful as the room may not be safe to enter. If there is a drip, armed with buckets and basins, you could consider making a hole in the ceiling to let the water out. Turn off water heating systems: Switch off the central heating, immersion heater and any other water heating systems. If the central heating uses solid fuel, let this die out. Once the water heating has shut down, turn on the hot taps to help drain the system. Water leaks: If water leaks near your electrics or electrical appliances, switch off the mains immediately. If it is wet, don't touch them! Electrical wiring damaged by water can be very dangerous. 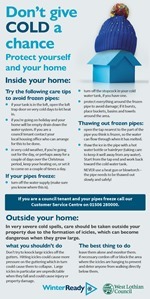 Burst Pipes InfoUnfortunately, very severe frost may cause your pipes to freeze. This is also an emergency, because once the pipe thaws, water is likely to come pouring from the break. Avoid problems if you can. Burst pipes and leaks can be complicated to fix and for outside pipes, repair work may also involve digging up your lawn, tarmac or paving. 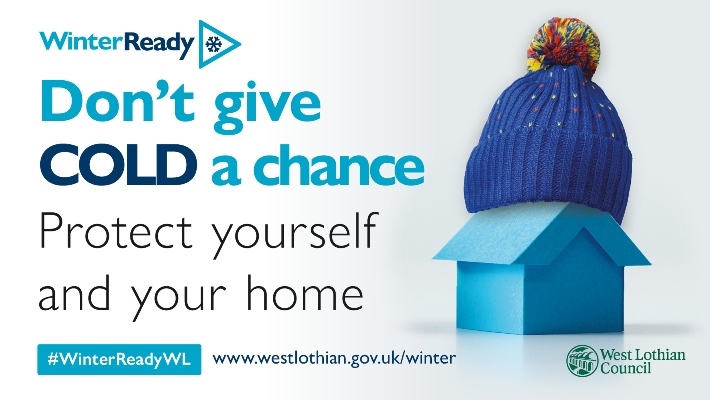 In very cold weather the heating will need to be on low, or set to come on a couple of times a day, especially if you're away for a day or two. If your heating thermostat has a 'frost' setting, use it while you're away. What can West Lothian Council do about it? If you are a council tenant, contact your area housing office immediately. If it is out of office hours, you will be given an emergency number. If you are affected by a leak from another property and you can't get access to it, Environmental Health can require the owner to fix the problem. If no immediate response is made by the homeowner, Environmental Health may make arrangements to stop the problem, obtaining a warrant for forced entry, if necessary. In these cases, the owner of the flat which has caused the problem will be billed for the costs. Do you know where your stopcock (water valve) is? Do you know which way is 'off' ? Do you have containers to collect water from a leak? Do you know how to switch off your system? Do you know how to switch off your electricity supply or affected parts of it? What if your water supply pipe bursts or leaks? Where you have a mains water supply provided by Scottish Water, it is responsible for everything up to the isolating valve in the street, the 'toby'. On your side of the 'toby', it is the home owner's responsibility to have the pipe fixed. In some places, a group of homes may share the connection to the mains water system at the 'Toby'. Where one of these pipes bursts, it is likely to a be a joint responsibility between all homes sharing the supply to have it fixed. If you share a mains water connection, it is worthwhile checking that your household insurance will pay for your share of repairs if needed.